Jump training is also referred to as plyometrics. The following page defines plyometrics and explains how to improve jumping power for volleyball. Plyometrics are drills or exercises aimed at linking strength with speed of movement to produce power. Plyometrics has become essential to athletes who jump, lift, and throw. Plyometrics can be defined as exercises that enable a muscle to reach maximum strength in as short a time as possible. To be fast and jump high, power is the name of the game. Muscles are our only musculoskeletal structures that can lengthen and shorten. Unlike ligaments and tendons, the other supporting structures, muscles possess a unique ability to impart dynamic activity to the body. In sports, athletes are concerned with three modes of muscle contraction. Eccentric contractions occur when muscles lengthens under tension. For example, when a volleyball player plants to jump, the ground impact requires the body's center of gravity to drop rapidly. When you plant your feet, you don't collapse at this moment because leg muscles contract and control this lowering motion. When you are in the air after you leave the ground, there is a brief instant you're in a static position with no muscle shortening. This brief moment between eccentric contraction and concentric muscle contraction is isometric contraction. In volleyball just like most sports, an eccentric muscle contractions (lengthening of muscles) is followed by concentric muscle contractions (shortening of muscles). For example, as you approach to hit a volleyball, as you plant your feet to jump, your legs must take the full body weight and stop the horizontal inertia of the jump-up. This "loads" the legs by rapidly forcing the muscles to stretch and undergo a rapid eccentric contraction. Nerves firing information to the muscle then cause a concentric contraction. These muscle responses occur with no conscious thought on the part of the player, but without them the player's knee would buckle and he would collapse to the floor. The muscle action is like a "spring"
Imagine springing up off the ground. As you plant to jump, pressure is put on the legs. Think of this as compressing the coils of the spring. The energy stored within the spring is then released as the athlete leaves the floor. To get the most out of this stored energy, you want to have a short ground contact time. Studies have shown that great jumpers and sprinters don't spend much time on the ground. Great athletes that rely on speed and strength have learned that energy is stored during the eccentric phase of muscle contraction and is partially recovered during the concentric contraction. However, the potential energy developed in this process can be lost (in the form of heat generation) if the eccentric contraction is not immediately followed by a concentric contraction. This coupling of eccentric-concentric contraction takes place within hundredths of a second. Great jumpers are on the ground for a mere 0.12 seconds! The key is shortening the amortization phase. The amortization phase is the transition phase between eccentric and concentric muscle contractions. This phase of the stretch shortening cycle is perhaps the most crucial in production of power as the duration of amortization must be kept at a minimum. If this transition phase were to last too long, the energy created during the eccentric contraction would be lost. NOTE: It's important to train to shorten the amortization phase. The ability to shorten the amortization phase is a skill that's developed through plyometrics (jump training). In physics, elasticity is defined as the property of a substance that makes it possible to change its length, volume, or shape in direct response to a force and to recover its original form upon the removal of a force. It's important to understand that muscle elasticity can help you produce more power than a simple muscle contraction. During jumping, muscles briefly store tension developed by rapid stretching so that they possess a sort of potential elastic energy. Think of what happens when you stretch a rubber band. Whenever you stretch it, there exists the potential for a rapid return to its original length. 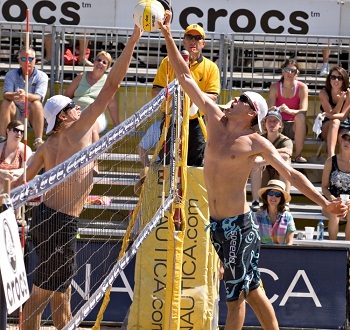 For most jumping in volleyball, it's important to focus on getting "vertical". Vertical speed and power is different than horizontal speed and power. For example, if you want to get up high, more focus should be spent on jump training to increase vertical power. Standing vertical jumps, Single leg vertical jumps, tuck jumps, and depth jumps are key exercises to improve volleyball jumping power.